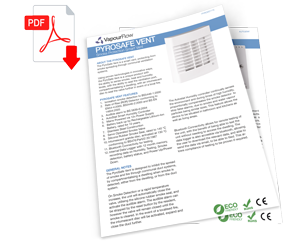 The PyroSafe Vent is a smart extractor vent, protecting from smoke spreading through communal ventilation systems. seal the valve further in event of a local fire using an intumescent disc. The PyroSafe Vent is designed to inhibit the spread of smoke and fire through communal duct systems by compartmentalising a dwelling when smoke is detected, either from the dwelling, or from the duct system. On smoke detection or a rapid temperature increase, the unit will automatically close the ventilation valve, utilising the silicone rubber smoke seal, and activate the audible alarm. The audible alarm can be stopped by the reset button, however the valve will remain closed until the smoke is cleared. In the event of a localised fire, the intumescent disc will be activated, expand and close the duct further. The integral Autostat Smart Humidity controller continually senses the environment, and during times of high humidity proportionally compensates the smoke detector to stop false alarms, due to smoke and water vapour particles being similar sizes. This feature allows the device to be situated in bathrooms and kitchens, as well as living areas. 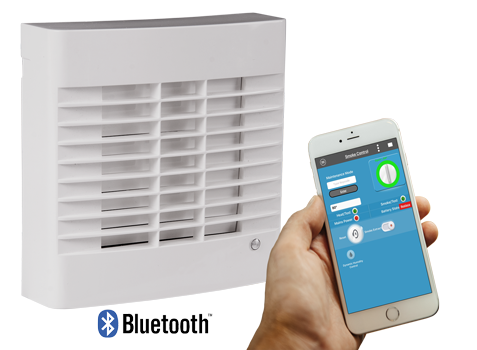 Bluetooth connectivity allows for extensive remote testing of the unit, with the benefit of being able to test the unit without needing to access the dwelling. The onboard data logger is also accessible via Bluetooth, allowing the user to download and then email the relevant data to be filed. This allows compliance of testing to be proven, if required. Our VapourFlow App for iPhone is now available on the Apple App Store. If you have any questions about PYROSAFE VENT or another Vapour Flow product, or need more information, just request a free call back and we’ll talk you through it all.